In addition to English, you can now edit your Google documents and spreadsheets on the go in 44 more languages. Mobile Google Docs lets you access, view, or edit your Google documents, spreadsheets, presentations, as well as files uploaded to Google Docs. You can view documents, spreadsheets, presentations and drawings on most phones that support HTML. If you're using Docs from an Android or Apple device, you can view the following file types: pdf, ppt, doc and docx. To begin editing, visit docs.google.com in your mobile browser, and select a document to edit. Switch from view to edit mode by pressing ‘Edit’ to turn on the mobile editor and start typing away. As you probably already know, mobile editing in Google Docs is available on Android (2.2+) and iOS (version 3.0+) devices. 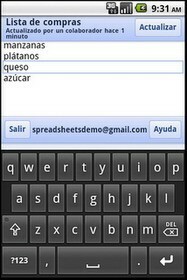 You can learn more about Google Docs for mobile on www.google.com/mobile. 0 comments on "Mobile editing in Google Docs supports 45 languages"